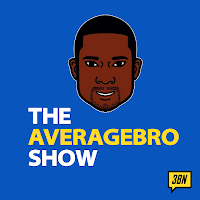 AverageBro: March Madness Is Here, And My Alma Mater Is Dancin'!!!! March Madness Is Here, And My Alma Mater Is Dancin'!!!! While I frequently talk about my HBCU experience here, I don't think I've ever actually mentioned where I went. This is largely intentionally, and very much in line with the "keep my identity anonymous" nature of the blog. 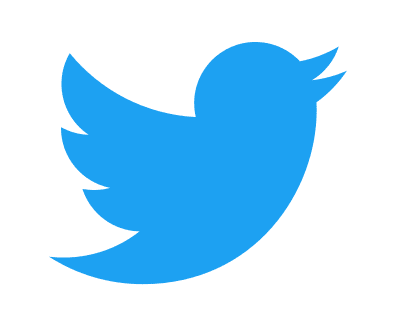 Today, however, I'm gonna make an exception to my (admittedly silly) own rule. Cause my alma mater is dancin'! The Big South and the MEAC collide in the NCAA play in game when the Liberty Flames and the North Carolina A&T Aggies square off. 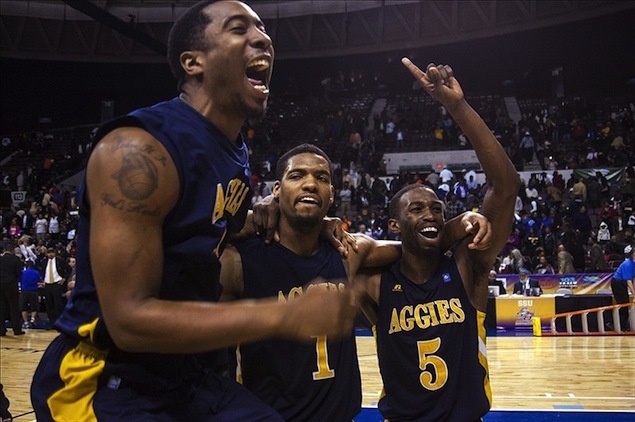 North Carolina A&T was one of the most unlikely entrants in to the Field of 64 as the 6th seed out of the MEAC. 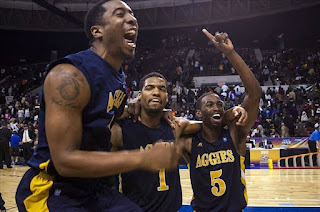 The Aggies overcame a red hot Morgan State in the conference championship but were surging themselves with victories in six of seven. This is the slowest team in the tournament, outscoring opponents 62-61 on the season, so controlling the pace and the scoreboard is generally their lone chance at winning with their attack hitting at 39% from the field. This is a team that needs plenty of shots to do their damage with Adrian Powell and Lamont Middletown as the primary scoring weapons with nearly 13.5 points apiece, but both need plenty of shots with under 40% from the floor on the year. Speaking of unlikely participants in the NCAA Tournament, Liberty is that team with just a 15-20 overall record. The Flames definitely caught fire at the right time with five consecutive victories, including a win over regular season champion Charleston Southern in the title game to gain the conference automatic bid. The Flames are one dimensional with their score first mentality as they were outscored 70-69 on the year but gave up 62 points or less in four of five which made this a winning team down the stretch with the offense clicking. If Liberty is to survive the trio of John Caleb Sanders (14 ppg), Tavares Speaks (13 ppg) and Davon Marshall (13 ppg) have to score because that has been the strength of the Flames. I'm not too crazy about being stuck in the play-in game, but the tourney is the tourney. My school made the Big Dance twice in the mid-90's, once while I was there. He lost to (eventual champion) Arkansas one year, and got obliterated by Tim Duncan and Wake Forest the other. We beat Liberty tomorrow night (early odds have us a 1.5 point favorite), and we get right right to be ethered by Louisville. Either way, we're in the tournament. Question: Did your team make it?